Well, well, Fangirls. Now that things with the Inventor have settled down, it’s time to head into a new story arc for our beloved Ms. Marvel. With a new illustrator, this series heads into a slightly new story, still bearing themes of all the intensity of issues past. The ghosts of the Inventor are still lurking about, and you won’t believe who they’ve got on the case. This issue also smells to high heavens with teen romance, which is a little out of character for this series as a whole. I’m not complaining, I figured it was bound to happen, but I’ll be honest and say that I prefer my Ms. Marvel without all the love drama. This series has been a pioneer in showing a teen girl as more than crushes and school dances, and I was hoping that she wouldn’t get caught up in all that. However, I suppose I’m still getting my wish, because it’s not necessarily her that’s tangled in that goopy love web. It’s Bruno. Which isn’t very unexpected, actually. It’s been clear from day one that he’s had a little thing for Kamala, and now he’s just finally attempting to act on it. Of course, he needs some help, though, whether he asked for it or not. Oddly enough, the same guy that’s now being forced to lend a hand on the Inventor issue, is also dolling out love advice to Bruno. The one and only Loki has arrived in Jersey City, Fangirls. After getting in some trouble with mom & pop, they demoted him for a while, and sent him down to Earth to do some good. They assigned him to the case of Coles High School, where Kamala goes, to ensure that the Inventor doesn’t still have any cronies hanging around ready to do some damage. He arrives just in time for Valentine’s Day, which is where he gets a little off track. Bruno is hoping to ask Kamala to the Valentine’s Day dance at their high school. Loki arrives to the Circle Q just as Bruno is discussing this with his brother, Vic. The whole situation is laughable to everyone except Bruno, including Kamala, who assumes he’s kidding when he timidly makes a suggestion about going. Also, props to the writer of this comic who debunked the myths of the “friendzone” after Kamala laughs off the interraction. You go, G. Willow Wilson. Loki offers, or rather insists, on helping Bruno compose a love letter to Kamala in a very confident, romantic sort of language. 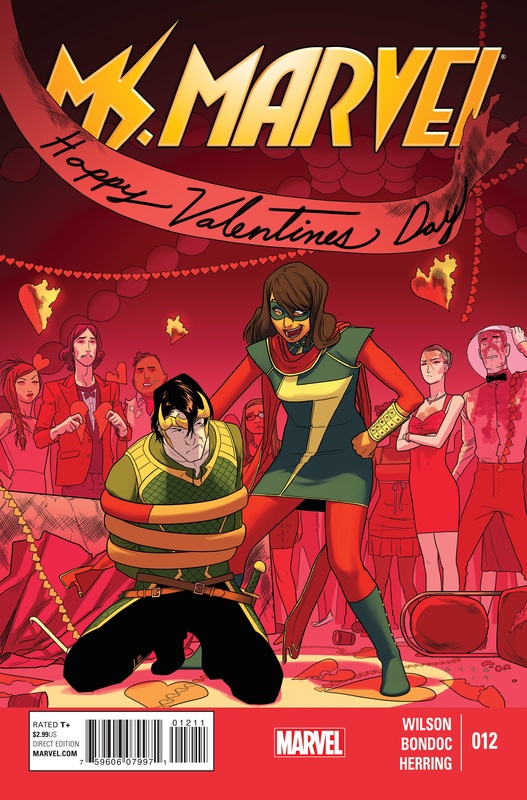 Loki gives the dramatic letter to Kamala by leaving it on her pillow, and after she is bewildered that someone is in love with her, she decides to go to the dance along with Nakia to figure out who her tall, dark, and handsome suitor is. Once she’s there, though, things don’t go as planned, of course. She spots Loki pouring something into the punch, a truth serum to help find out if anyone is working for the Inventor. Ms. Marvel then arrives to lay the smack down. However, the problem is resolved once Josh, the big jock of the school, dumps some of the truth serum punch on Loki, which cause him to calm down a bit and explain himself. Ms. Marvel asks that he keep his attention on protecting the school, rather than causing mischief, as he is so want to do. 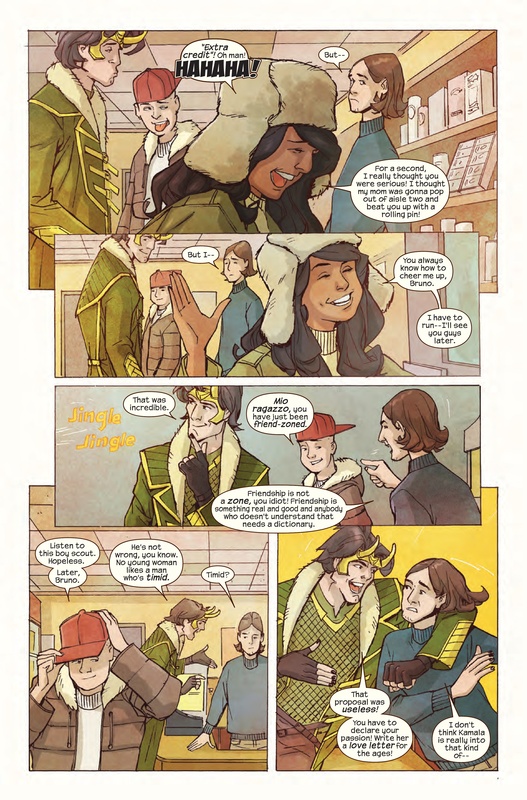 Loki goes on his way, telling Ms. Marvel that he’ll report no findings of the Inventors henchmen, and leave Coles High School in Ms. Marvel’s hands. Farewell, Loki, it was kind of odd to see you here. 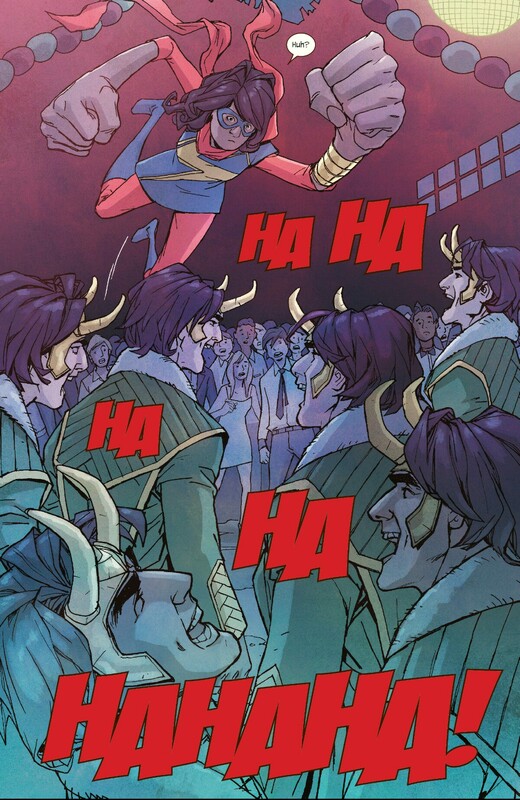 The issue ends with Bruno and Ms. Marvel having a short little friend talk, about how Ms. Marvel / Kamala is happy that he always has her back. Clearly, Bruno would like to say some lovey feelings, but doesn’t. Who knows what will happen with that whole thing. After the chock full of intensity & action last few issues, #12 was definitely a cool down. But that’s alright, it was no less witty, hilarious, and meaningful than any of the others. Plus, after issue after issue of Inventor vs Ms. Marvel, it’s probably good to have a bit of a breather. I have no doubt that Ms. will be in the thick of it again soon, Fangirls. Huzzah!